JUCHEREAU DE LA FERTÉ, DENIS-JOSEPH, half-pay lieutenant; baptized 20 June 1661 at Quebec, son of Jean Juchereau* de La Ferté and Marie Giffard; died a bachelor; buried 9 Aug. 1709 at Quebec. La Ferté’s presence among the fur-traders of Lake Superior in the autumn of 1683 is referred to in a letter of 12 April 1684 from Daniel Greysolon Dulhut to Governor Le Febvre* de La Barre. La Ferté went down again to Quebec the following spring, no doubt, since he took part in the governor’s expedition against the Senecas. 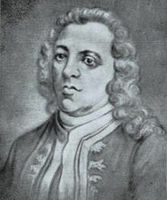 He is mentioned as captain of the Cap-Rouge militiamen at the review which was held on 14 Aug. 1684 at Fort Frontenac. 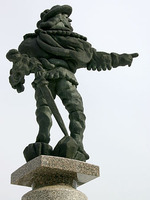 On 7 Aug. 1685 he took on Laurent Glory for a journey to the Ottawa country; in 1686 he was to be found at Michilimackinac, whence he was preparing to return to Quebec. He was apparently a member of Brisay de Denonville’s expedition against the Senecas in 1687, which included “La Ferté’s company.” It was apparently to this Juchereau that Buade* de Frontenac, on 15 Oct. 1691, gave a commission as a half-pay lieutenant. At the beginning of 1694, La Ferté, together with Jean-Baptiste Le Moyne de Martigny, a cousin of Pierre Le Moyne d’Iberville, and some other officers, was accused of disturbing the peace in Lower Town at Quebec. In the same year he went with Louis Jolliet* on a voyage of exploration to Labrador. He turns up as a midshipman on the Wesp in 1697; this was one of the five ships that Iberville was taking that year to regain Fort Nelson, in Hudson Bay. In the spring of the following year La Ferté’s was sent from France as a messenger to warn Frontenac of the preparations being made by New England against Canada. There is no further mention of him until 1703, at which time he had a quarrel with an ensign named Noël Chartrain, to whom he administered a severe thrashing. An affair of this kind, between officers, was fairly serious. 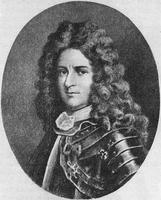 Rigaud de Vaudreuil, who was leaving for Montreal at that time, ordered the king’s lieutenant, Antoine de Crisafy, to put Juchereau in prison. The next day Crisafy, on the request of his wife, who was the prisoner’s cousin, set him free. Vaudreuil had to imprison him again on his return, thus rousing the ire of the attorney general, François Ruette d’Auteuil, and of the latter’s son-in-law Crisafy. 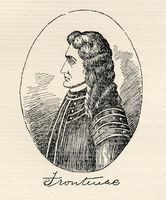 Paul Dupuy de Lisloye, the lieutenant of the provost court of Quebec, presided at the trial. Chartrain thought Juchereau’s sentence too lenient, and the king allowed an appeal to be made to the Conseil Supérieur, provided that the judges were not related to the defendant. But in 1705 Vaudreuil was able to write that the incident was considered closed. Meanwhile, La Ferté had served as lieutenant to Morel de La Durantaye, who was in command of the Joybert, a brigantine which had been fitted out at Quebec in 1704 for privateering against the English in Newfoundland. Denis-Joseph Juchereau was never more than a subaltern officer, and apart from his escapades he scarcely attracted any attention. 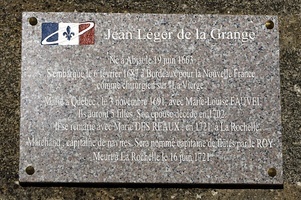 At his death he was buried at the Hôtel-Dieu of Quebec, as were several members of his family. “Correspondance de Vaudreuil,” APQ Rapport, 1938–39, 22–23, 86. Découvertes et établissements des Français (Margry), VI, 44. “Estat des employs vaquans ausquels Monsieur le comte de Frontenac . . . a pourvu en Pannde 1691 en attendant les commissions de sa majesté,” BRH, XIII (1907), 341. “Journal de Louis Jolliet allant a la descouverte de Labrador, 1694,” APQ Rapport, 1943–44, 195f. P.-G. Roy, Inv. coll. pikes jud. el not., I, 281. Bonnault, “Le Canada militaire,” 376. J.-B.-A. Ferland, Cours d’histoire du Canada (1534–1759). (2e ed., 2v., Québec 1882) II, 190. P.-G. Roy, La famille Juchereau Duchesnay: 54–56; Fils de Québec, I, 63–65; “Un corsaire canadien: Jean Léger de La Grange,” BRH, XXIV (1918), 65f. Lucien Campeau, “JUCHEREAU DE LA FERTÉ, DENIS-JOSEPH,” in Dictionary of Canadian Biography, vol. 2, University of Toronto/Université Laval, 2003–, accessed April 25, 2019, http://www.biographi.ca/en/bio/juchereau_de_la_ferte_denis_joseph_2E.html.